The fundamentals of Sustainable agricultural practice are drafted from ecology, more specifically a holistic relationship with soil, plant and animal, in which proper nutrient cycling is best for land and body. Underpinning the Entrepreneur Agrarian Fund’s objective to consistently deliver high-quality and nutritious food within various marketplaces is a requirement to cultivate quality soils through proper husbandry within a defined and customized holistic land management system. Each EAF farm enterprise creates a customized crop selection and rotation plan pertaining to amenities of the specific parcel, area and agrarian talent. Established by in-house expertise and reputable strategic partners, farm plans work within the EAF network to diversify farm risk, efficiently deliver quality food and maximize profitability to meet market demand. SUSTAINABLE FARMING is the inevitable future of agriculture. Investment in modern sustainable farming practice avails many financial incentives with premium product gains not available to commoditized foods, nor conventional practice. Like conventional farmland, investment in productive sustainable agricultural land is non-correlated to other asset classes and is an excellent hedge against inflation and deflation for both long and short-term horizons. Teaming with globally revered strategic partners, the Entrepreneur Agrarian Fund is pioneering a process to maximize investor returns by deploying capital that unearths regional land values on fallow prime farming parcels by utilizing equity from environmental market compensation and empowering an underutilized workforce to team with fertile soils and grazing animals to change land cover and produce more quality local foods to meet growing market demand. 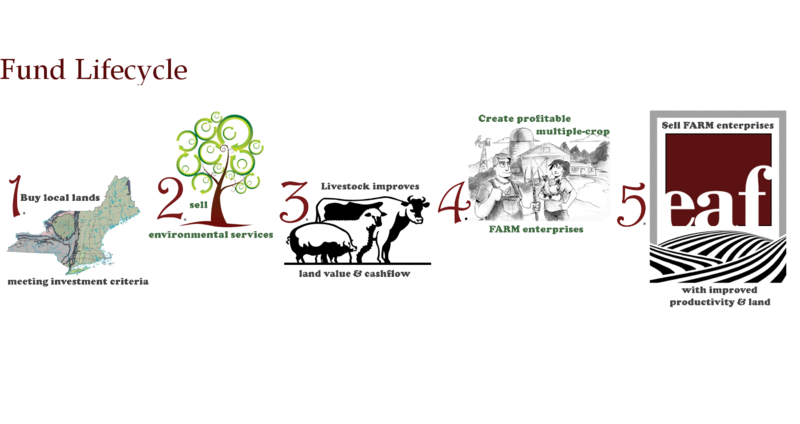 For the reason of production of more nutritious and safer sustenance; the establishment of food security in the NorthEast; and utilization of environmentally conscious shepherding of local natural resources – the EAF is an alternative-class investment reaping financial benefit for enacting significant change. Promoting sustainable agriculture in the NorthEast, the Entrepreneur Agrarian Fund (EAF) acquires prime parcels of New England & New York land to strategically invest in the creation of diverse farm enterprises that improve land value & productivity. Meeting growing market demand for meats from grass-fed and foraging animals through the proper use of holistic livestock management on local farmland affords EAF farms opportunity to develop improved land cover, enhance soil fertility and generate a diverse and consistent cash-flow. This process results in a replicable framework to establish profitable farm enterprises that progress economies of scale in a NorthEast food system that produces only 5% of the food consumed regionally. Ecological land transformation and productivity improvements set stage for more efficient operations that increase cash flow, require less inputs and develop more attractive margins that lead to land and farm enterprise appreciation. Environmental markets reduce land acquisition costs and incurred expenses to transition to improved agricultural land; the EAF maximizes these mechanisms to build asset value and cost effectively craft quality local foods focused first on sustenance from fertility of soil. EAF Smartfarms utilize Innovation and technologies to empower consumer desire and awareness for better local food while affording new capacity for direct-to-consumer disintermediation. Establishing diversified crop outputs on larger farm enterprises modifies risk as land and farm values increase in the hands of the appointed agrarians who have potential to acquire farms donning their sweat-equity. Sustainable Agricultural practice has become synonymous with Holistic land management; a whole farm plan constituted of environmental, market, economic and social practice working in unison. This practice of banking long-term nutritional value through bolstering soil health, libido and vibrancy accrues with production of less-risky higher-quality real-food, added resilience and crop fertility, smaller environmental footprint and increased land value. For these reasons, the practice of sustainable agricultural is an ideal marriage with the objectives of environmental markets and conservation Land Trusts. Entrepreneur Agrarian fund (EAF) is an alternative class investment vehicle specializing in the acquisition and management of sustainable farmland throughout the NorthEast – REIMBURSED by ENVIRONMENTAL MARKETS, especially focused on CONSERVATION EASEMENT. Lowering the effective cost of land acquisition and management, the EAF employs environmental markets to leverage equity buying power and lower investor exposure. Environmental markets are mechanisms designed to utilize market-based forces to quantify and address environmental challenges. Sustainable farming practice and land has proximity to numerous types of environmental markets and services. (i) Wetlands Reserve Program; (ii) Wetlands, Habitat and bio-diversity credits; (iii) Water Quality trading markets; (iv) Renewable Energy Markets; (v) Greenhouse Gas Credits; (vi) Public and Private Conservation Easements. Conservation easement is a type of environmental service where legally enforceable land preservation agreements are drafted between a landowner and a government agency. Designed to preserve greater tracks of quality or prime land, conservation easements sell the development rights where federal, state, local and private agencies co-paying a significant portion of the sticker price on suitable land. For potential EAF farmland, conservation easements help subsidize the acquisition of prime parcels of land suitable for agriculture. 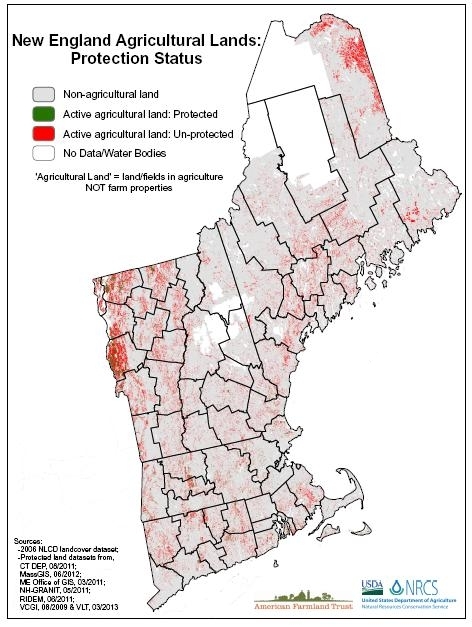 The birthplace of land conservation, the NorthEast is home to 35% of all US landtrusts; 600 reputable organizations that we look to align with on local preservation of land and body through sustainable agriculture on conservation easement. Designed to protect land and natural resources, conservation easements now make it possible to add scale, and empower a regional real-food movement. The 2012 U.S FarmBill secured level funding for agricultural land easements, which pay back as much as 40-50% of the appraised development value on suitable land. Most recently, the 2013 FarmBill consolidates the Ranch Lands Protection Program (FRPP) and Grassland Reserve Program (GRP) into a single group, the Agriculture Land Easement (ALE). The ALE has dissolved federal acquisitions and term easements, now provisioning grants to buy perpetual easements through local land trusts (the 2013 FarmBill has earmarked $1.38B for easement acquisition).